The musical transcription of the hydrogen spectra using the law of the octave is the harmonic basis for 'hearing' in quantum physics. The vibrations of hydrogen are shaped by pure intervals: Octave, fifth, major third, natural seventh and eleventh harmonic. The harmonic structures of hydrogen (element No. 1) its associated frequencies and their sound structure are of special scientific interest. 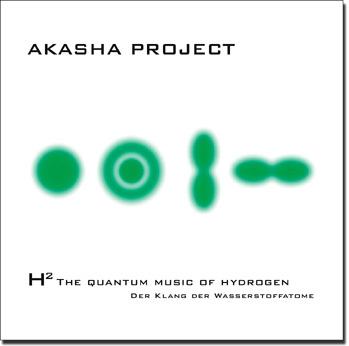 Since the individual frequencies are determined by very specific types of electron transitions and their corresponding energy levels, the sound structure of hydrogen reveals quantum physics to the audience through acoustic patterns. Over half of all atoms in the universe are hydrogen atoms. Therefore, the frequencies of hydrogen in the Universe are fundamental, since they occur more frequently than all other frequencies together. 01. Balmer (Balmer Series) 07:44 min. 02. Quantality Part 01 (All Spectra) 35:21 min. 03. Crystalisation (All Spectra) 04:30 min. 04. Quantality Part 02 (All Spectra) 13:07 min. 05. Infinite Border (Rydberg Constant, Paschen And Pfund Maximum Value) 05:46 min. 06. 06. Spin-Prepared Piano (All Spectra) 10:39 min. If we examine the spectral lines of the hydrogen, we see a number of narrowband spectral peaks (maxima), whose appearance can be described in simple mathematical series. These series are named after their discoverers (Lyman, Balmer, Paschen, Brackett, Pfund). They represent the electron transitions within the atom and are in a sense its 'fingerprint'. Transposed to approximately 40 octaves down, these spectral peaks are perceived by our ears as sounds. In 1999 the Swiss mathematician and musicologist Hans Cousto calculated the complete series of octave-analogue tones of the hydrogen atoms using the formula for transposing octaves. With this work Cousto provided an important indication that even at the quantum level of atoms, the harmonic laws retain their validity. Quantum music is a self-composing music, since the electron transitions of the atom determine which sound can be heard and when. In addition, octave-analogue frequencies are also used to modulate the sound parameters so that the sounds themselves are 'hydrogen modulated'. In performance, the proportions of the different spectral ranges and their limits, the depths of tonal modulations as well as their transpositions are controlled live for frequency and rhythm. This creates an acoustic journey through the atomic reality, which seems familiar and strange at once. Hydrogen is the atomic 'stem cell' of our universe. All matter and thus the world in which we live, and ultimately we ourselves, were created from hydrogen. Meditations with the sounds of hydrogen can give an impression about what holds the world in its core together. I am listening to your Hydrogen Baby/Mother and really really like it. It 'goes down easy' as we say..... just washes one with soothing sounds, like a cradle rocking. And of course I love those microtones.